This process stimulates your skin to enable muscle toning, draining of liquids from intercellular space, and the production of new collagen and elastin. The Enhancer definitely enhances the results of any treatment you do and also the look of your clients complexion! A great addition to any facial, Microdermabrasion, or chemical peel. This gentle bio peel will smooth fine lines, wrinkles, and hydrate the eye area to look years younger! The perfect combination of 3 extraordinary treatments for your eyes. 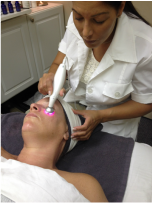 using Bio -peel to exfoliate to break down dead skin cells to both upper and lower eye lids. Followed by a collagen mask to reduced and minimize the appearance of fine lines and dark circles and hydrate. Ending with galvanic to help plump and penetrate product which firms and tightens this delicate eye area.